There’s good and bad news from Northern Ireland tonight, first the bad news. 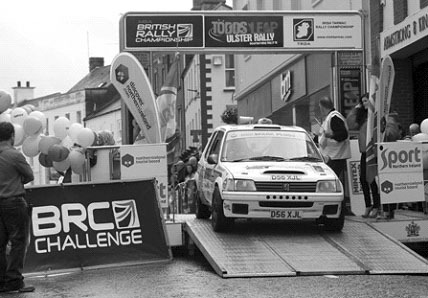 John MacCrone and Phil Pugh crashed out this morning on the 8th of Rally NI’s 15 stages. John and Phil are both OK, but the Citroen is rather unwell. Osian Pryce won from Jukka Korhonen. There's better news from the Ulster Challenge where Ross Hunter’s win has moved him up to 4 th place in the NGK Spark Plugs Challenge despite completing the last two stages stuck in third gear. Gareth White was fifth. With 3 scores from four rounds so far, Ross has moved up to fourth overall in the BRC series, with leader Russ Thompson, second placed Gareth and third placed Richard Sykes each having scored on all four rounds so far. Steven Smith is 7th and Des Campbell who didn’t go to Northern Ireland is still ninth with two scores. After his disappointment on yesterday’s Ulster Rally Challenge Steven Smith bounced back on today’s Ulster Challenge 2 and finished second behind Dean Raftery.